Can I really do this? 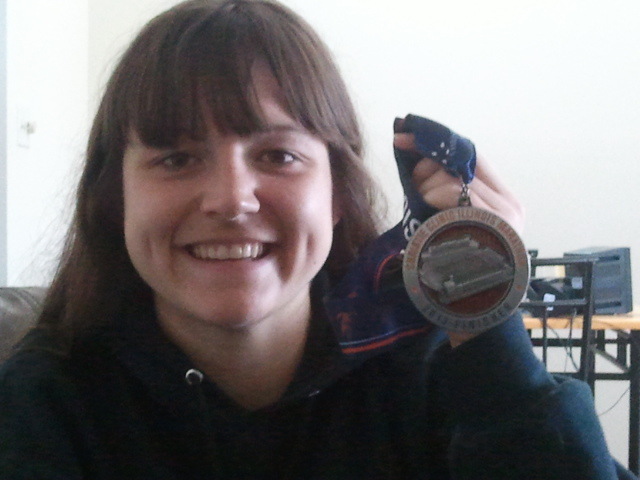 Can I really run a marathon? Those were the first thoughts that popped into my head when I woke up before my alarm at 5:15 am on Saturday. After a rough night's sleep, I was anxious. All week my thoughts had wavered back and forth between I trained for this, I totally got this and OMG, I'm not ready. But it isn't like a had a choice because on Saturday, I was running a marathon. But first, let's rewind a bit. I took Friday off from work so I could pack for the weekend and run a few errands before heading to Champaign. Since I had Jimmy John's for lunch before my last big race, I decided it would be a good idea to have it again. In reality, I just wanted one of their pickles and Jimmy John's is delicious. My friend Laura and I headed to the expo to pick up our bibs and shirts. The expo wasn't especially large, but we did spent some time walking around and looking at different vendors. I didn't end up buying anything because I've spent way too much money this month, but it hindsight, I wish I would have bought something to commemorate my first marathon. Once we got back to Laura's apartment, we headed out for a nice, easy, two-mile run. After so many long runs in this training cycle, 2 miles flew by. Laura was my go-to running partner in college and we haven't been able to run together in awhile so it was nice to put some miles in together. For dinner, Laura prepared a delicious turkey pasta dish along with salad and cheesy bread. And, as is my tradition, I had one good beer. Most people probably don't drink any alcohol the night before the race, but I figure one won't hurt and it is mostly carbs anyways. So why not? It was a great carbo-loading meal. We went to bed around 10 and I tried to get a good night's rest before the big day, but as usual, I didn't sleep very well. I woke up several times and finally called it quits on sleeping 5 minutes prior to my alarm going off. 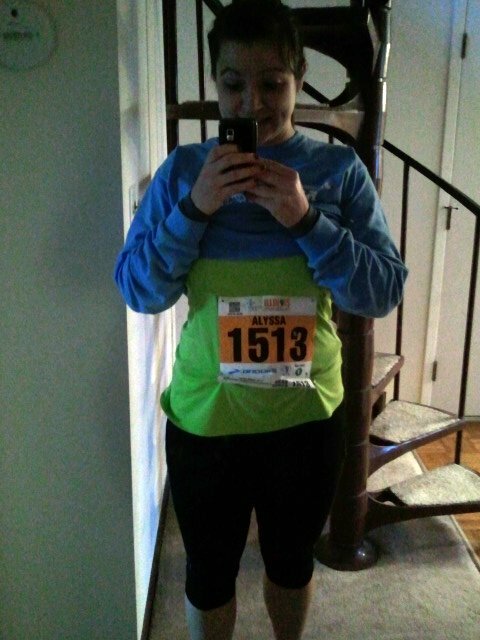 I got up, got dressed, braided my hair, and pinned on my bib. I'd been debating most of the week on what to wear for race day. It's been so chilly this month that I figured I would need to wear long sleeves, but the forecast ended up being a high in the 60s on race day and a temperature of about 48 degrees at the start. I ended up choosing a tank top with capris and brand-spankin' new arm warmers purchased on Thursday (thanks to the suggestion from Kim). That whole "nothing new on race day" saying...yeah, I'm really bad at following that advice. I actually could have done without the arm warmers because I was plenty warm during the race. Breakfast was a small cup of coffee, two slices of toast, peanut butter, banana and honey. That's my standard and it works great. Since Laura lives so close to the race, we didn't leave until 6:15 for a 7 am race. We still had plenty of time once we got there to hit up the bathrooms, do a little warm-up jog, and drop our bags in gear check. At about 6:50, I gave a good luck hug to Laura as she headed to corral C and I headed to corral E. We observed a moment of silence for the victims of the Boston Marathon bombings and listened to the national anthem. I enjoyed the last few minutes of calmness before the start of the race. Now, a little about time expectations. Going into the race, I wasn't really sure what to expect from myself as far as finish time goes. According to the McMillan running calculator, my half marathon PR of 2:00:10 should get me a marathon time of 4:12:54. That seemed a bit too ambitious for me. Being my first marathon, I didn't want to be disappointed with any finishing time. So when people started asking what my goal time was, I just started answering 4:15, even though I didn't think that was going to happen. I was pretty sure 4:15 would only happen if everything went right on race day and I had an excellent running day. I had planned to start out with the 4:15 pacer, but come race morning, I couldn't find the group so I just decided to start by myself and see if I could find them later. My plan was to go out nice and easy and have a conservative first half. I typically time my runs with my phone, but decided to run without it and without a watch. I think running without any time would give some people a panic attack, but I actually prefer it this way. I check my watch way too much and then get disgruntled because time is moving so slowly. I felt excellent at the start and made sure to focus on keeping it easy. I found some other runners running at about my pace and just tried to run right behind them. The crowd on the first half of the course was awesome and I didn't listen to my music at all. I just took in the energy from all the cheers. I made sure to grab a cup of water at each aid station. I realize 60 degrees isn't all that warm, but when 98% of your training runs are in sub-40 degree temperatures, 60 is quite the shock. I dedicated each 5-mile segment to different people in my life-my mom, dad, brother, grandparents, and Matt. But decided to run the last 1.2 miles for nobody but myself. At the beginning of each block, I took a few moments to think about how these people have influenced my life. Of course, there are many more people I could have dedicated miles to, but I wanted to keep it simple. My fueling plan was to take half a gel approximately every 2.5 miles starting at mile 7. I always take gels with water so I just took a gel whenever I hit the closest aid station. I took gatorade at the stations when I wasn't taking gels, but that ended up like only being 2 or 3 times throughout the race. Although they provided Gu on the course, I brought my own Clif Shot Gels in Citrus flavor along in my fuel belt. I didn't train with these (seriously do as I say, not as I do), but did use them in training for my half-Iron last summer. The flavor reminds me of Mountain Dew and that is why I like them so much. Please keep in mind that I haven't had any pop in 2013, so if you try these and think they taste nothing like Mtn. Dew, you can blame my lack of Mtn. Dew consumption. The first half of the race flew by and the spectators were awesome. I remember the course being a little crowded last year through the park and it was crowded again this year, but I didn't think it was quite as congested. I did have to take a quick bathroom break before mile 12 due to a crampy stomach, but it didn't give me any problems after that. I was a little irritated that I had to wait in line, but I probably only lost 90 seconds there. Right before the split off from the half marathon near mile 12.5-ish, I got passed by the 4:10 pace group. I was slightly worried I had gone out too fast, but I still felt great. I don't have splits for each mile, but there were 3 timing mats on the course so I figured out my average pace between each of those mats. The spectator scene was a lot more sparse on the second half of the course, so I ended up putting my music in to keep me distracted/pumped up. Around mile 16 or 17, I started running with another woman about my age. She was keeping a great pace so I decided to run next to her. Her name was Leaha and this was her second marathon. She was aiming for 4:15 as well and was trying to beat her time of 4:19 from a few weeks ago at the St. Louis marathon. I told her I also had my eye on 4:15 but I didn't quite know where I was on my time goal and I hadn't yet seen the 4:15 pace group. Turns out she had been running with the 4:15 group, but the pacer had to drop out at mile 13. Leaha also told me that a few weeks before she ran her first marathon, she found out she was pregnant. I was and still am so impressed. It was nice to run and chat with her for a few miles. She definitely kept me going strong through those miles and they flew by. I ended up losing her around the mile 21 aid station when I took a walk break to eat an orange. I kept her in my sights for the next 2 miles and tried to make up the difference between us but she was running strong and I never caught back up. At mile 23, I really started to hit the wall. This kind of mileage was all new territory for me and I was worn down. My pace slowed and I had to take a few more walk breaks. Up until that point, I had only been walking through water/aid stations a bit to drink. Mile 24 seemed like a never-ending hill. Granted, Champaign is very flat and I did some long runs in Cascade so I am trained on hills. This hill was not very steep, but it went on forever. My legs were tired and I was not having it. I knew there would come a point in the race where I really just wanted to quit. This was that point. My whole body hurt. My feet were tired and my legs were tired. When I started walking, I knew that 4:15 slipped away. I thought 4:20 was still in my reach and pushed myself to run again. I continued to run/walk most of mile 24. At an aid station at mile 25, I took a short break to grab a drink of water. Another runner was right beside me and he encouraged me to start running with him again. We slowly started making our way to the next mile and I told him how bad my feet hurt. After about 5 minutes, he dropped back but told me to stay strong. At this point, I told myself I wasn't walking again. I could run all the way to the finish. I was passing a lot of people and I drew my strength from that. It wasn't a fast pace run but I would guess that I was running about 10 min/mile at this point. The faster I run, the sooner I can be done. I powered on. I saw Laura's boyfriend along the sidelines and waved at him and I realized she might still be on the course. The stadium (with the finish line) was in my sights now. It looked so close and so far away at the same time. Keep running. The spectators really kept me going at this point. They were cheering and calling my name. One spectator looked at me and said, "Alyssa, you got this. Keep going. Stay strong." I can only imagine how my face looked at this point. I wanted to cry. I hit mile 26 and new the finish line was just around the corner. We went around a corner and down a small hill and turned into the stadium. I passed another group of people and was giving it everything I had left. The finish line was at the 50-yard line and I "sprinted" to it. There is nothing like that feeling of crossing the finish line. All the hard work you've put in over the last months, the pain of the race, the hurt--for a few moments you can forget about all that. I had just run a marathon. It's hard to not get emotional and I shed a few tears. I made my way to get my medal and pick up a bottle of water. I was so thirsty. I wanted to sit down, but I knew if I did I would not be able to get back up so I kept walking. Laura and I had agreed to meet on the field so I wanted around and about 5 minutes later I saw her. We did it! She, however, did not take my advice and sat down. I spotted Erin in the crowd and hobbled over to talk to her. This was her 4th marathon! It wasn't an easy race for her either, but she did awesome! We eventually made our way up the stairs to get our post-race food and our free beer! It usually takes a while for me to be hungry again after a tough run, but within a half hour I needed food. The bread rolls they had were absolutely amazing. I'm starting to feel a lot better. The first few days this week, I was exhausted every day and kind of emotional. My legs were super tight and walking down stairs took a lot of concentration. Another weird effect, swollen feet and legs. Check out my cankles. Yesterday, I wore compression socks to work and that seemed to help a bit. Even though I thought I Body Glided every part of my normal chafe zones, I still have some spots. Including on my back from my sports bra--that was a new one for me. My feet look pretty good save for a blister on each of my big toes, but I think all my toe nails will stay on. Even though I didn't hit my "goal" time, I am still very pleased with my time. I ran a very smart race. I didn't push too hard at the beginning and felt great for a lot of the race. I do wish I would have walked less in miles 23-25 but I feel like I gave it my all. Would I run a marathon again? At this point, I can't say. I always want to run more races to improve my time, but training for a marathon takes a lot of time and I had to make sacrifices along the way. I guess we will see. The Illinois Marathon is an excellently executed race. The spectators were a little thin on the second half of the race, but the ones I did see were awesome. And as always, the volunteers were amazing. I will be back next year for one race or another. You can check out some of my race photos here!